Two GTA conservation authorities are warning of increased flood risks later this week as rising spring temperatures begin to thaw months' worth of hard pack ice and snow. Toronto and Region Conservation Authority (TRCA) flood risk management engineer Rebecca Elliott told CBC Toronto that the region is expecting to hit 12 C by Thursday. Elliott said this could increase hazardous conditions such as flash flooding in low lying areas, higher flows and water levels, and ice jams around bridges and culverts. Areas most at risk include the Humber River at King Street, Broda Drive, and Old Mill. "I'd just like to stress safety because rivers are going to be higher and faster and we know people will be wanting to get outside with the nicer weather, so we just want them to be careful," Elliott told CBC Toronto. Keeping an eye on children and pets was essential around streambanks as these could become extremely slippery and unstable due to thawing and refreezing ice, she said. Residents are advised to clear catch basins of any debris and ice so water would not pool and overflow, Elliott said. TRCA continues to monitor the situation and advisories would be issued once melting conditions begin to speed up, she said. Credit Valley Conservation (CVC) water resources and flood risk senior manager John Sinnige said the Credit River, which has three major ice jams located at Ferndale, Glen Williams and Meadowvale, is of particular concern; while urban creeks in Mississauga and Brampton were not expected to be an issue. This year's melt would have two major differences when compared to previous years, Sinnige said. 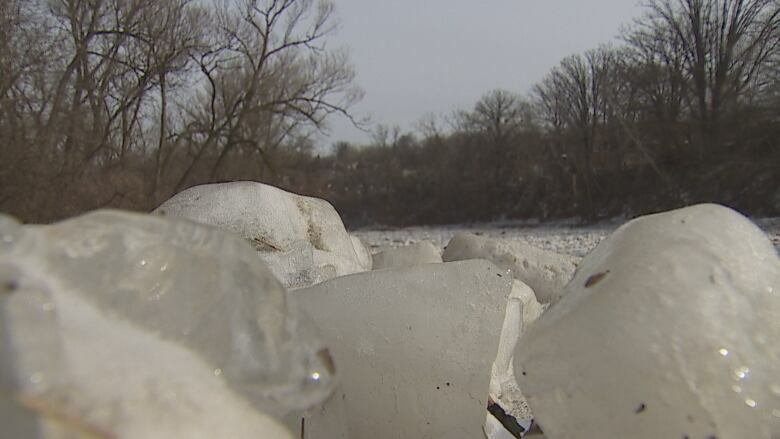 "We haven't had to support a municipality in carefully blasting an ice jam since the mid-80s and we haven't had a situation in recent memory in the Credit River where there have been ice jams that have lasted more than a month," he told CBC Toronto. CVC will be actively monitoring the Credit River's water level and ice condition as temperatures rise, Sinnige said.